What is a Bear Fight? A Bear Fight is the drink of all drinks. 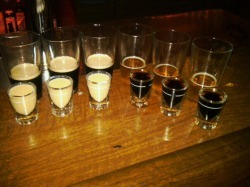 It consists of two cocktails taken one after the other - a Jägerbomb and an Irish Car Bomb. You simply line up the drinks, drop in the shots, and take one after the other. Boom. Boom. It is not for the weak. Why is it called a Bear Fight? Wait 5-10 minutes after you drink the Bear Fight and you'll understand why it earned its name. 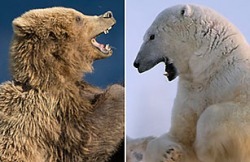 It feels like a grizzly bear and a polar bear are having a fight in your stomach. Where can I get a Bear Fight? - Order it at your local dive bar. - Pound it at a swanky night club. - Concoct a Bear Fight at home. Bear Fights are sweeping the nation and soon will be as ubiquitous as vodka tonics. Want to share your story? Submit it to The Bear Fight Nation here.